I have made my mom's apple cake recipe a zillion times. My mom, obviously, has made the recipe a zillion times. It's a combination of eggs, flour, sugar, apples and a few other simple ingredients. 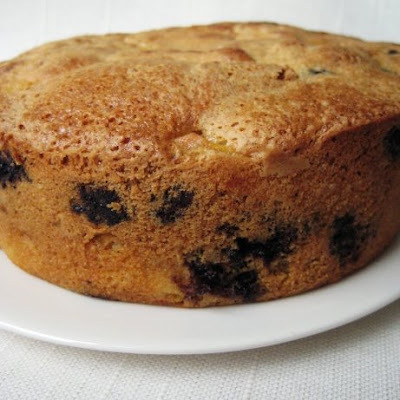 A few weeks ago when I was meeting Anna's friend Angela at Eastern Market, I was reading Southern Living magazine, which had a recipe for peach and blackberry cake: it looked gorgeous! Then, I saw beautiful peaches and blueberries at the market. 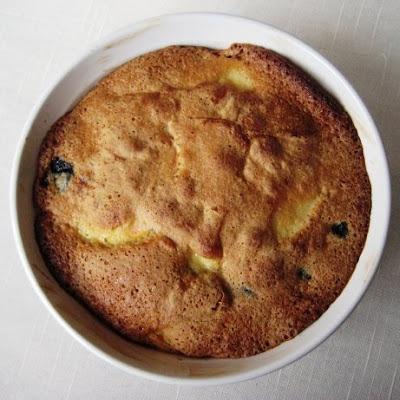 Then, when I went grocery shopping, peaches and blueberries were on sale: everything was coming together and I decided to alter my mom's apple recipe to make Peach and Blueberry Cake instead. 1) Preheat the oven to 375. 2) In a large bowl beat 3 eggs. 3) Add 1 cup of sugar to the egg mixture and blend together. 4) Pour 1/2 teaspoon of baking soda into white vinegar - the two ingredients will react and bubble - add to the bowl with eggs and sugar and mix. 5) Slowly incorporate the flour into the above mixture. 6) Add 1 tablespoon of yogurt and the zest of 1/2 lemon to the batter and mix. 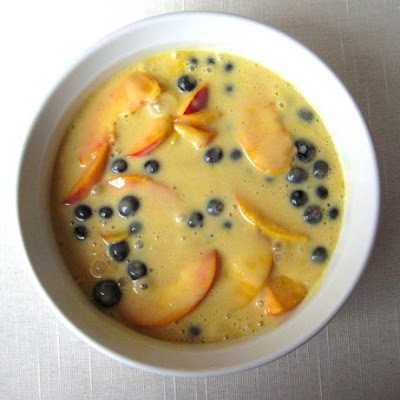 7) Carefully incorporate peach slices and blueberries. 8) Spray a baking dish (I used 1.5 quart souffle dish) with oil or butter the dish. 9) Pour the batter into the baking dish and bake 45-80 minutes (it all depends on how deep your dish is: the cake is ready when a toothpick comes out dry). 10) Let the cake cool, and flip on a serving plate (if baking in a bundt pan). I really liked how this cake came out! If your fruit and berries are very sweet, you can decrease the amount of sugar in the recipe. This is good for breakfast, as a snack or as dessert. Feel free to use any other stone fruit or berry combination. this looks so fantastic and i loved how you showed the products at the market and then how they can be used in gorgeous and yummy looking cake! This looks seriously delicious. Did your Mom's recipe for apple cake use yogurt? It's an inquiring minds kind of thing :-). OMG now I'm craving apple cake...can you overnight me a piece? Might have to make one this weekend! Yummy :), this looks delish. 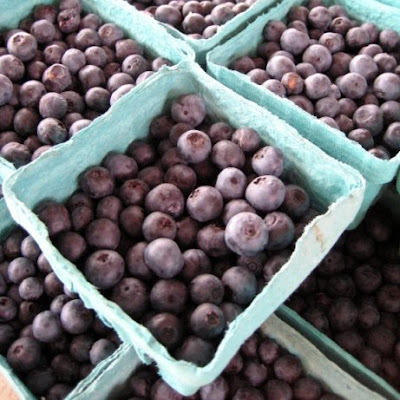 Those peach and blueberry pics are tastespotting/foodgawker gold, be sure to submit those! looks so sweet! I want it now! oh my! this looks gorgeous! i love how you bake them in individual ramekins. Wow...this looks so easy and so yummy! It's definitely on my list to try. Oh I would love to try this! Looks like a great summer pudding. This is such a pretty cake, I love recipes that are easily adaptable to make new creations. Great colors from the fruit. Of course this is going to be good! I love peaches and blueberries together. This sounds amazing! 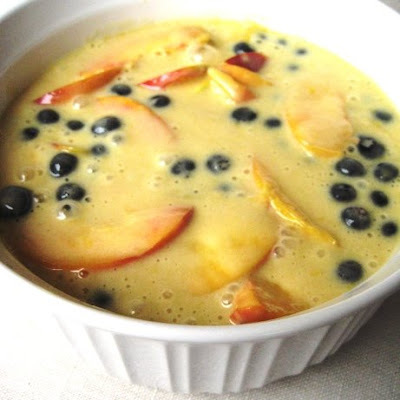 Love the combination of fruits...peaches and blueberries...looks delicious. 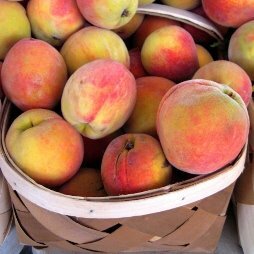 I definitely like signs like blueberries and peaches at the farmer's market. Looks amazing--you take great pictures! Looks awesome! Love your photos! This cake is soo pretty and it looks so soft and sweet and delicious! I could definitely eat that the entire day! It looks delicious Olga! Isn't it funny how we can sometimes be so used to making certain recipes in one way that we forget to try and do it differently? Yours looks very successful! With 15-lbs of fresh picked blueberries in my freezer, and peaches reaching the peak of their season..... 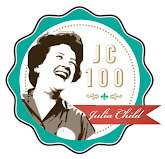 I think this is an awesome recipe idea! This looks so delicious! 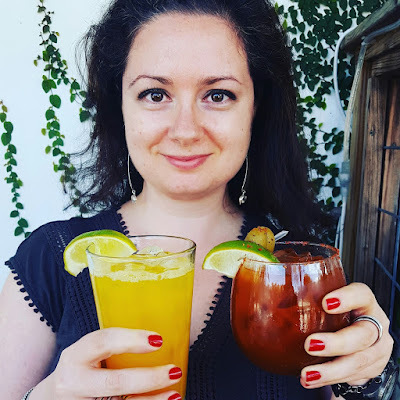 I followed you from the foodieblogroll and I'd love to guide our readers to your site if you won't mind.Just add your choice of foodista widget to this post and it's all set to go, Thanks! I have blueberris and peaches and was looking for just the right cake! I made this wonderful anytime treat this evening. This recipe is a keeper! Thanks for sharing. This is the kind of dessert that's too pretty for frosting :)! Made this today and it was absolutely fabulous, and very straightforward to make. thank you for sharing!